Woolworths employees Travis and Natasha Angus, PMH Medical Services acting executive director Meredith Arcus and Woolworths worker Katie. 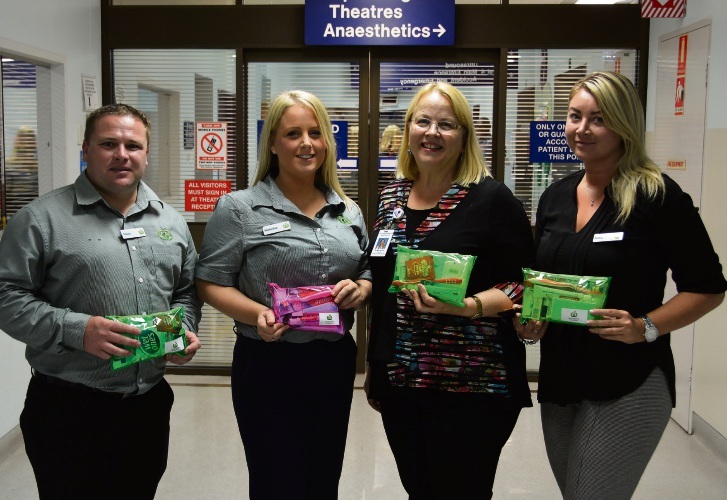 WOOLWORTHS Secret Harbour team presented care packs to Princess Margaret Hospital for children on Friday afternoon in an effort to aid emergency visitors in need. Woolworths stores will provide 400 care packs to PMH for distribution to emergency patients and their carers who would stay overnight. Overnight care packs are currently provided only to hospital visitors with private health cover. Princess Margaret Hospital executive director Victor Cheng said Woolworths would help provide a more comfortable experience for West Australian families visiting PMH. “Everyone who has made an unexpected trip to the emergency department with a loved one knows everything else takes a back seat, including self-care,” he said. Woolworths Secret Harbour store manager Natasha Angus said she hoped the overnight care packs would provide an extra bit of comfort to the families of PMH patients. “We are incredibly proud to be able to provide a helping hand to West Australian families who are going through such difficult times,” she said. Each pack contains care items including toothbrushes, wet wipes, toothpaste, mints, tea bags and tissues.